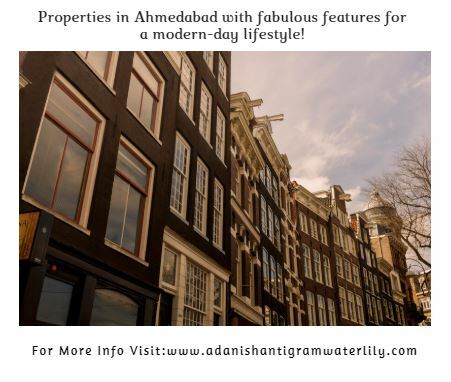 A residential development for a modern-day lifestyle in Ahmedabad! Ahmedabad is an incredible city in the state of Gujarat that has a lot to offer its inhabitants. There is something special about this city that you just cannot find elsewhere. Today, Ahmedabad is one of the most loved cities in the country that many want to be a part of. The real estate market in Ahmedabad is booming today with a number of residential and commercial projects throughout the city. Ahmedabad has always been one of the safest cities for property investments as this city has always seen positive growth. Investing in Ahmedabad has become has become even more safe after the implementation of the Goods & Service Tax (GST). A 5% decrease in housing post GST is definitely a reason to celebrate. A decrease on tax for construction elements will lower the prices of different residential spaces. A real estate consultant has stated that there are high possibilities of an apartment costing Rs.1 Cr. to drop down by 3-5 lakhs on an average. It goes without saying that a GST rate at a fixed 12% is a brilliant move that has been taken, a move that will either reduce tax liability or keep it neutral for that matter. Without a doubt, a rise in property purchases will automatically increase the cost of residential space and the same will yield good profits at the end of the day. To top it off, the approval for the Ahmedabad Metro Rail Project will push the real estate market even further in the days to come. Phase-1 of the metro project will have 2 corridors that will be covered. One being the North-South corridor that will start from APMC, Vasna and will go up to Motera Stadium, while the other being the East-West corridor that will start from Thaltej Gam and will go up to Vastral Gam. With the implementation of GST and an improvement in infrastructure for better connectivity, Ahmedabad is one of the best and safest cities for investments that will generate good returns at the end of the day. However, choosing the right project by the right real estate company is also important for fruitful benefits and a modern-day lifestyle. 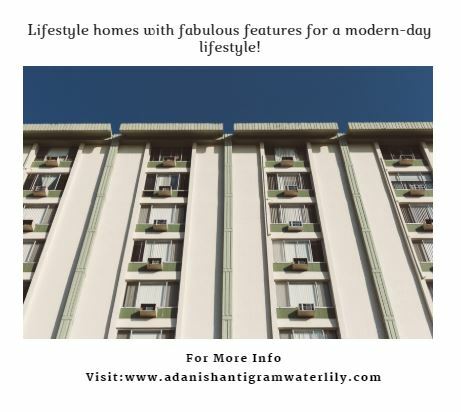 Adani Shantigram Water Lily is an impressive residential project in Ahmedabad and a part of a 600 acre township by Adani Realty that offers superior luxury and comfort in every corner. Spread over 32 acres, this development contains 15 towers that offer premium variants of 3.5BHK, 4BHK and 5BHK luxury apartments/penthouses with area sizes starting at 2433 sq. ft. and gradually moving up to 6440 sq. ft. When it comes down to features, this development offers the most exclusive features for a modern-day lifestyle that will be loved by one and all. The apartments are spacious and contain luxury fixtures and fittings, elegant kitchens, high-quality flooring, safety features and more. This development also offers a wide range of external amenities that include a clubhouse, well-equipped gymnasium, swimming pool, multiple sports facilities, theatre, multipurpose hall, shopping centre, well-planned car parking and high-end security. With prices starting at Rs.81.50 lakhs only, a residential space at this development is definitely worth a buy, an investment that you will always appreciate.